It’ been a busy month for Steve and I. Since we are empty nesters it’s a bit easier to get away, however we have jobs and fur babies so we greatly appreciate the help we had so our getaways were successful and joyful! At 70 years old, Steve’s boss George is one sharp tack. I hope to have just a small piece of what he has when I am that age. George was a pilot in the Vietnam war. Since shortly after Vietnam, however, George stopped flying for reasons I am unaware. A few years ago he decided to get back in the pilots seat and has found a new love for flying. 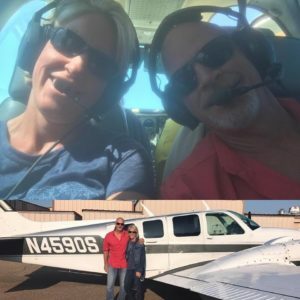 He and his wife, Glenda, had been wanting to take Steve and I on a trip for some time and it finally worked out for all of us to take off for a 3-day weekend. George currently flies a twin engine Baron. I have never been in a plane this small, so this was a first time for me and I’d be telling a tale if I said I wasn’t a bit nervous upon take off….mid flight (to Lynchburg)….and then back on the ground. By the time we took off for Asheville, however, I had settled in and got a little more comfortable with the situation. With the hum of the engine, the sun pouring in through the windows, and the distant chatter of air traffic in my headphones, the stage was set for a perfect nap….or it could have just been that huge lunch we had at Ms. Mary Bobo’s that put me to sleep. At any rate, I very much enjoyed the remaining time in the air. That weekend was pretty awesome, from beginning to end. Steve and I savored our time with George and Glenda, shared in a lot of laughs, and learned more about each other. 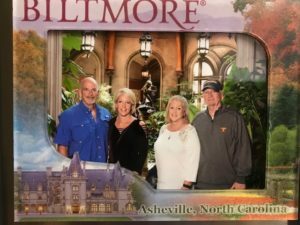 The tour of the Biltmore hotel was incredible (put that on your list) and we enjoyed each new experience…and wine, there was a lot of that! The following weekend was a bit different. 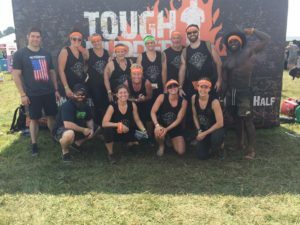 Thirteen of us have been preparing to take on the 10 mile, 20 obstacle Tough Mudder challenge, and the time had finally arrived to put our training to the test. The morning of the event, brought clear skies, a beautiful sunrise with a hit of nervousness. Most of all, the morning brought joy! For many of us, this was our first Tough Mudder. As with most new experiences,, apprehension often rides its coattail. However, any apprehensions we had were quickly erased with a rally by our awesome MC, along with the National Anthem…then we were off! The group eventually had a natural divide to it as everyone hit their running stride. We never saw Greg Freeman after the first 100 meters, David and Jenn broke out next. Steve, me, Brett and Garrett stayed together, and behind us were Nicole, Meghan, Sharon, Anna, Tina, and Kendra. Each of us faced off with the TM in our own way, running our own race. The TM is designed to be completed as a team. That team may not be who you came with, it may be a complete stranger who ends up running alongside you. There were obstacles to overcome one could not reasonably achieve on their own. We depended on complete strangers for help and in return, we helped those complete strangers. 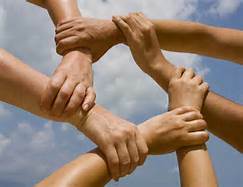 Having help did not mean you weren’t strong or capable, it meant you were a teamplayer and we each played a role in creating an enjoyable experience for those around us. I am reminded of the song, With a Little Help From My Friends . My favorite version of this is from Joe Cocker, such an amazing artist. 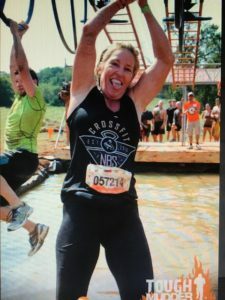 My biggest fear of all the obstacles was the one called Electroshock Therapy. There are 10,000 volts of electricity running through the 1000 wires dangling over mud, water and hay bales. This was absolutely terrifying to me and I had zero interest in running through it. 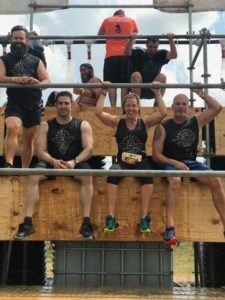 It was the last obstacle on the course and when I saw it, I knew I couldn’t do it. I went around it and I have zero regrets. Maybe its just psychological and I can’t get past it. Maybe I have a deep fear of it because I ran through barbed electric wire as a child and tore my mouth up, or maybe it’s because my great uncle (Big Ben) died of electrocution while checking his well out on the farm. Whatever it is, running through live wires is just not something I can do and I’m ok with that. I tested my physical fitness that day and each of us did something that we had never done before and we did it with a pretty awesome group, all from right here from NBS. We’ll forever be connected by that weekend with the memories we created together. To me, that is what life is about…sharing experiences with one another. Last weekend we were a bit closer to home as I attended my 30th year class reunion. Our Senior song was Lean on Me. Who knew at that time how much those lyrics would eventually bring to our lives. Growing up in Brinkley, Arkansas, (current population, appx, 2,798. Population in 1987, appx., 4,232.) gave us all the small town experience each of us have grown to love. Eighty seven students, class of ‘87. Most of us entered school together in Kindergarten or 1st grade, and we received our diploma together some 12 years later. 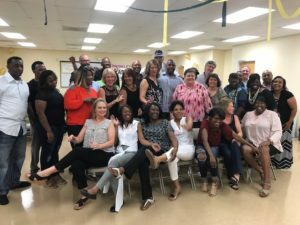 The majority of our class left Brinkley upon graduation, went on to attend nearby universities, and returned to Brinkley only for visits with family. I too left the day I graduated, as I knew it was not a place I wanted to stay and raise my children. At one time, it could have been. We were a typical rural town with shops downtown, that included clothing boutiques, Western Auto, antique stores, Sears & Robuck and every little specialty store you could think of. Drive through the town now and it’s hardly recognizable. The stores have closed, the buildings abandoned, and all but the memory of Saturday morning shopping trips, rots on the foundation in which they were built. I found myself reminiscing unrecognizable areas. They were familiar, but not. Much has changed and much has not. Friday night I met my classmates at the football game. As Steve and I approached the school, the lights from the field illuminated a vast array of cars parked in the lots, along the streets, and in every grassy section nearby. I think the entire town must have been at the game Friday night. I was amazed as it was only one short month ago that the news was reporting that Brinkley High did not have enough interest in the football program (or enough kids) to even have a team. Apparently, the town, the school and the kids all rallied together to continue the Brinkley tradition. It was an awesome site to see! There has always been a lot of Brinkley Pride, 30 years later, it is no different. My time with my classmates was wonderful. We had real conversations with each other. Conversations about how many of us overcame multiple challenges as kids to go on to become very successful adults. Rural towns are very different, at least Brinkley is anyway. One did not discuss their family’s problems. It was important for the family to hide their issues because ‘saving face’ in the community was much more important. Knowing now what many of my classmates endured creates an even more profound respect for them and their current successes in life. Eventhough we don’t see each other regularly, we all are bonded together forever. We are bonded through our love for Brinkley, our pride for a town that is doing its very best, and pride for our alma mater, Brinkley High. Looking back over the last few weeks brings me such a sense of joy and fondness for the friends that I have made over my 48 years. We cannot walk through this life alone, and why would we want to? We need experiences in our life to draw from and we need people to depend on. Our challenges make us stronger and we need people willing to lend their knee when we need a lift. Facing challenges, embarking on new experiences and asking for help can be very difficult, but think of the strength and the blessings that are waiting for you on the other side. I am reminded of a song by Darius Rucker (I love him) For The First Time. Our MC at the Tough Mudder brought this back to my attention. Listen to the song, ask yourself the question, and then answer it. Great blog! You have a gift in being able to express yourself in written form. Love it.